(3 x 1/2-inch) Lemon rind strips. Boxcutters, Jigger, Citrus Juicer, Strainer, Tablespoons, Flûte. 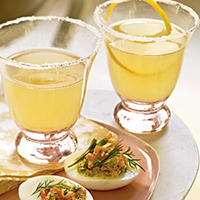 Roll up each strip of Lemon rind; place into each of Champagne flutes. Add Liqueur and Juice to each glass. Serve immediately.